Trying to get things back to normal ... There are some other posts that I need to get to, things like birthday parties (the pics are coming Lori and Laura, and the'll be worth the wait! ), Memorial Day, and Christian concerts, but for now, I'll focus on our little miracle, Lily Grace, and her big brother, Matthew Austin and her big sister Amanda. I really feel like I'm the most blessed Dad in the whole world, but I'm certain that every Dad feels the same. So please forgive my biased and unmitigated boasting about Lily Grace and Austin and Amanda in the following paragraphs. Austin is having a really busy summer. He has more energy than anyone I've ever seen. He finished the school year at East Limestone on the "A" Honor Roll for the entire year. He accomplished this while participating in band, managing the high school football team, and playing on the jr varsity golf team. Wow, no wonder we hardly ever saw him during the school year. After school let out for the summer, Austin immediately set off for Petra camp - a week of Christian youth fellowship and worship. He really enjoys his time in the Word and we couldn't be prouder of him for that. He's even teaching Lily Grace about Jesus and how much God loves her. He has a passion for Christ and for the music that leads him to worship. This week he had one of his goals fulfilled in that he met the lead singer for Hawk Nelson and talked with him a little while as we waited out the thunderstorms at Faith and Fireworks Night at the Joe. 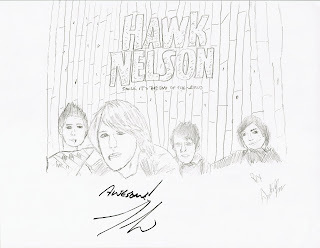 Austin showed Jason (that's the lead singer) a drawing of the group that he had made on the way over to the concert. Jason was very impressed and didn't want to autograph it because he didn't want to mess it up (he autographed the drawing after we told him it'd be ok). After the concert and after the baseball game, Austin spent a little while talking to the drummer, getting tips for his own drumming at Isom's Chapel. When we left, Austin was so excited at getting to meet and talk to them, you'd have thought the Red Sox had just won the pennant or that the 'Noles had just claimed the national championship. Austin and Jason, Buds! "Don't Even Think About the Earrings and Hairdo, Austin!" As for our little miracle, Lily Grace is doing just fine, thank you. She's completely potty trained now (sorry for the graphics, just had to get that in there), telling us well in advance of every need to visit the potty. One night at a local pizza restaurant, she and Connie visited the potty and when they returned, Lily Grace made certain that everyone in the room knew that she'd just used the big potty! A few clapped at her achievement! (Others finished their meal quickly and left in a hurry for fear of what future announcement might come from the little prodigy.) Memaw has taught her to count to 10 and she usually gets all the numbers in. She occassionally tries for twenty, but the teens get her confused. Last night, as we were relaxing together and having some snacks, Lily pulled a Doritos chip from the bag and said "Look Amanda, a triangle!" We all laughed and she thought she'd just told the funniest joke ever. Her clothes and shoes have to match (which of course relieves me of most of the dressing responsibilities) and she'll tell you if they don't. Yesterday, we took Lily Grace and Austin to a party at "Pump it Up" in Pelham. The party was sponsered by the International Adoption Clinic in Birmingham. So we got to spend some quality time with Lily's doctor (Jennifer Chambers) and her twins Lily and Kate. After a few nervous minutes, Lily Grace was off and running (literally), mixing it up with all the other little international kids and having the time of her life. Jesus said "Let the little children come to me." Getting Ready to Swim - More on this in a Future Post! As for Father's Day, it was kind of tough. It seemed as though there was this gaping hole that needed to be filled, something that needed to be done, but there wasn't. I tried to fill it many ways, but nothing worked. One father said that the best way to do it is to keep God at the center of your life, show love and respect for your wife and children, and pray continually. Sounds like good advice to me. But having children to be a father to certainly helps. This was the first of what I hope are many Father's Days that I get to spend with Lily Grace and with Austin. It's the coolest thing in the world knowing that God let me be a Father to Austin and to Lily Grace, especially after the rough start she had in life. I am so blessed to have this privilege (not lucky mind you, because with God there are no coincidences or luck - He plans it all) and I praise God and thank Him for that. And if all that weren't enough, just when I really needed it, Amanda comes in with a big, no gigantic, chocolate chip cookie that says "Happy Father's Day!" Thanks Amanda, I needed that. You're one special "daughter" too! Lily Grace and Amanda, Sisters Forever! Oh, one last thing. Since my own father passed away Memorial Day, I guess God decided to comfort me with a cool little present of His own. This week I pulled a book off the shelf in my study that I hadn't touched in 20 years - oh come on now, you have books you've not touched in a while too. This book was about Aristotle. My father had given it to me when I finished high school or maybe college, I don't remember. Anyway, just out of the blue, I picked up the book and noticed something folded up inside it. I pulled it out and discoverd a newspaper article from June 20, 1973 announcing the opening of "The Music Center." There above the half page ad was a picture of my father, proud owner of "The Music Center," a new full service music store set to open in Athens on Saturday the 23rd of June 1973. How cool is that? Thank you, Father!! Next post ... a birthday party in Florence - lots of pics! i hope your father's day was not only filled with the precious moments of the present but wonderful memories of the past. we continue to pray for you. I enjoy reading about your precious children, I know you are so proud of them! I'm glad you had a blessed Father's Day. I think it is so neat how much your son loves music and how your Dad loved music, too! That is a gift that now can be passed through the generations and everyone can remember your Dad that way, even his great grandchildren and so on. Welcome to Green, Party of Six! Here you can learn about God's miracle in the adoption of Lucy Hope. Hello, we're Jerry and Connie Green and we have four beautiful children. Austin is our high school senior, Lily Grace is our adorable 1st grader, Lia Faith is our kindergartner, and Lucy Hope, our new toddler, is on her way home!